A dreary day beckons outside while breakfast greets us safe inside the dining room of the ryokan for our introduction to natto. What is natto? The correct answer is that it’s sticky fermented soy beans enjoyed with rice, the realistic answer is more like a combination of vegemite, anchovies and warm beer with the texture of lumpy phlegm. Yes they’re as foul as they sound. One thing that natto does well however is wake us up; we’re padding through the water slicked streets of Gotemba to the convenience store to buy lunch, snacks, WiFi and drinks. Where Japan has often beautiful yet wholly useless cafe’s, the comforting bosom of a convenience store sends us on our way. As the bus departs we’re left on the black gravel lunar-scape that is the base of Mt Fuji, or as we say here, Fuji San. A nervous excitement grips us as usual but more so for the presence of Aki who is poker faced as usual. After years of rugby together we all know each other pretty well, Aki who will run through brick walls and ask for the next one to charge at has no persona of fear but today there’s uncertainty there somewhere. In truth Fuji isn’t the biggest mountain ever, only 3776m, so there’s no great fear of failure to summit but with a whopping one day of nearly 2km vertical ascent we need to pull the reins in on Aki. Given his determination that I would never want to be on the wrong side of, he’s likely to face uncertainty with all out assault and make the six hour walk in two hours. Aki is facing challenge the only way he knows how, banishing any notion of failure, while we’re pulling back the reins of a raging bull and kamikaze pilot all in one. 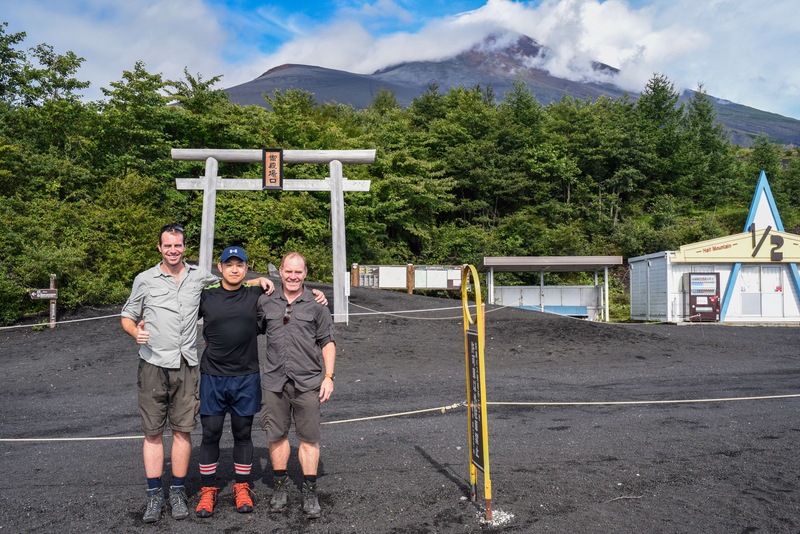 Steve, Aki and Charlie prior to starting the asent of Fuji San, Japan. The early stages of the walk take us scuffing our feet along the black gravel that look a little like a road before the steamroller flattens it, still under the blanket of cloud that has been our last few days. The slope is gentle but up ahead Fuji San ramps up steeply before disappearing into the mist and the other world we’re destined for. Regular stops for food double as a way to moderate the kamikaze Japanese bull that is Aki and take in the scenery that is just now panning out before us; bleak, desolate and mysteriously inviting. Fuji San is of course one of the most recognisable images of Japan, anyone the world over can spot the perfect conical shape of this iconic volcano that graces bank notes, stamps, postcards, songs, poems and countless artworks. But it’s the top, the summit that gets all the accolades, the peak that lies beyond the clouds so far away. 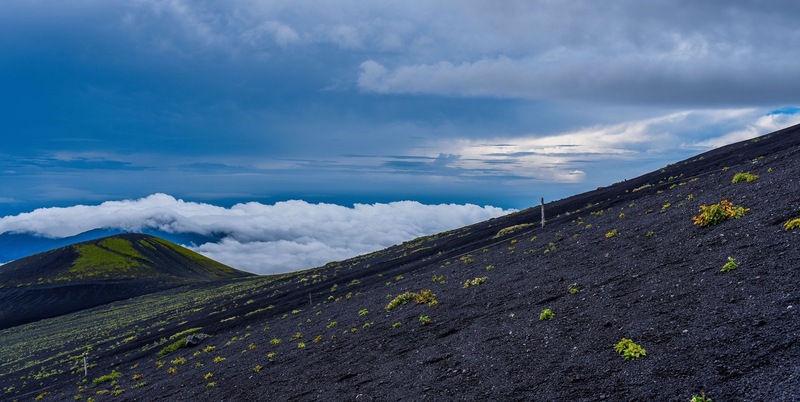 The ground steepens, our legs begin to take on some fatigue and in the guts of the thick cloud cover the famous Aki determination grips uncertainty and strangles it into non-existence. There’s no rain, just cloud, fog and the repetitive crunch of hiking boots scuffing into the sandy soil at each step for a better foothold. At about 2500m altitude the fog begins to thin and our suffocated world of cloud begins to deliver us to a life of privilege in the unlimited world where sky becomes forever once again. On a short stop with some chocolate and a fish sausage which is surprisingly good, the world to us is now just this world famous icon and an ocean of puffy cloud reaching out forever. Looking down on the sky from Fuji San, Japan. We hoped we would rise above the cloud but we never know until we walk, the gloomy day is now for those below us and Aki for the first time gets his glance at what this is really all about. Being above the clouds is an adventure, a trip into another world; like scuba diving in some ways. Below the water we go to a different universe we don’t really belong, where breathing in sends us swimming like the birds to fly with the fish and regress to a previous era of our evolution with fins for feet. Down there in that world of blue we can see the veil of the surface that greets the other world, not entirely removed but in a kind of dream, a fantasy world that we can’t stay in forever as much as we’d like to. On the ever steepening scorched scree of Fuji San a similar feeling of removal takes place. The world below is there, we can see it but the veil of a waters surface persists, this time not in the sharp exchange of water to air but in the gentle graduation between cloud and clear sky. People go to work below that cloud, they huddle under awnings and umbrellas and look upward to the thin slice of atmosphere their imaginations are allowed to inhabit. We’re in our different world now and that veil of separation is clear to see in billowing white plumes that roll on forever. There’s no rain here like down below, the air is crisp in place of humid and the stillness is replaced by a whistling relentless movement, so alive. In this world the summit of Fuji San is not a dream lost in clouds, it’s above us and comes ever closer on the repetitive shuffle of boots on gravel. Sunset from 7.9th station, Fuji San, Japan. We’re at 3030m altitude and no longer flirting with the veil of cloud to our other world, we’re towering above, feeling distant and removed. Or is everything just upside down? The air is thinner and after five hours of taming the raging bull, Fuji San takes over our job for us; there’s only an hour or so for the last push upward but fatigue grips us all as Aki persists almost on his famed determination alone. 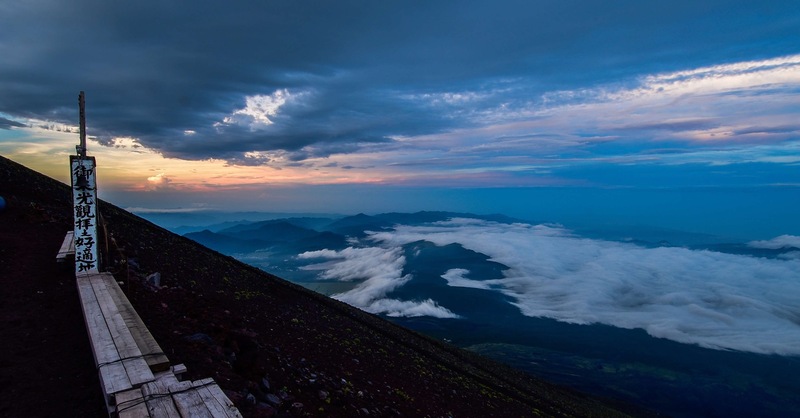 A global population of billions reduces to a few hundred of us huddling in shelters like 7.9th station that cling to the steep face of Fuji San near the top to scoff down a hearty dinner and enjoy a cold beer. Thirty dollars for a few bottles of water feels like highway robbery but like changing currency to a new country we’re changing currency to a new world as we settle to attempt some sleep in the rarified air near the top of an icon. It’s easy to spot the slightly confused wonder of Aki in this new world for the first time but in truth the excitement is fairly evenly spread, we never get tired of this. On a regular day hiking we climb about 1000m vertically and after nearly 2000m today we’re all a bit smashed; Fuji San isn’t a huge summit but the price has to be paid. Down there below the cloud, the rain feels like such a constant, a part of our world that can’t be denied or changed, a force of nature that underpins our reality. Up here, looking out at the lights of a city beginning to pierce the clouds so far below the jarring wrongness can’t be avoided; the city lights below are the stars through the clouds that should be above. The world we knew, the rules, the forces of nature that just are, and will always be, are proven wrong. On our feet alone we’ve pierced that veil and while a suffocated world persists below we’ve tricked nature and outrun the rain to where we need no breath or wings to feel like we’re flying, just the black scorched earth of Fuji San with no imagination necessary.